If you don't understand the information provided, you should contact a qualified hardware and / or IT professional. You are responsible to ensuring that adequate systems are purchased. We will answer questions your qualified hardware and / or IT professional have to help them identify systems that meet our minimum requirements. However, we DO NOT make specific recommendations on brands and models of computer or networking hardware. You MUST NOT install the software to the “Program Files” or “Program Files (x86)” folder on the server. Microsoft virtualizes the user writable files and as a result of this, different Windows users will see different data. We recommend installing to “C:\ExecuTech\Hotel” or your own preferred application folder. The following specifications are a basic reference for the requirements of Execu/Tech application software products. Execu/Tech's requirements typically fall far below the minimum specs of a new business grade computer. Do not use mapped drives. Use the UNC syntax! Antivirus software must be installed on the server and all clients. Don't try to save money by not purchasing antivirus software. It will be a very costly mistake. You WILL get a virus without it. Your antivirus software should exclude all files in the installation folder with the extensions .fil and .txt. These are indexed data files plain text files and cannot be infected. Failure to do this can cause extreme degradation in the software performance as each file will be scanned every time it's accessed. You should be sure that the clients are not scanning the shared drive on the server. Failure to do this can also cause extreme degradation in the software performance. Backup software and hardware are just as important as antivirus software. Without it, you risk losing all customer data, accounting information, reservations, advance deposit details, charge and payment details, etc. Execu/Suite PMS and POS applications are installed at the server and run from the client via shortcut to a shared folder on the server or via Remote Desktop Services or similar application. Execu/Suite PMS and POS use a Vision 3 database and the database files are typically contained in the application folder. The database is driven by the application runtime and no other database application like MS Sql or MySql is required. This is the general application design. Execu/Suite Activities is installed at each client, accessing an SQL database which can be installed anywhere. This should not be confused with our PMS and POS applications which do not use an SQL database. Execu/Suite applications are written in several programming languages. Execu/Suite PMS and POS are primarily written in Microfocus Extend. Execu/Suite Activities is written in VB.Net. Most interfaces (Phone, Internet Billing, Movies, CRS, etc.) are written in VB.NET. Netbui and IPX/SPX should not be used because it will cause file corruption. 100BASE-T minimum. Gigabit or faster is recommended. Execu/Tech does NOT support hubs and you shouldn't be using technology that old, anyway. If data transmission encryption is required you should use a reliable encrypted VPN between the client and server. If you're using Microsoft's Remote Desktop Services, you can encrypt it with an SSL or it can also run through an encrypted VPN connection. We aren't able to guarantee the operation of our software over a WAN VPN connection unless Microsoft's Remote Desktop Services is used. For remote support, we are only able to support the Windows VPN Client. There is no industry standard VPN device and our customers have chosen to use a variety including SonicWALL, NorTel, Cisco, Linksys, D-Link, Cyberguard, Symantec, Netgear, Juniper, Watchguard, Fortinet, and more. We cannot possibly install and operate all of these VPN clients at once and will not attempt to do so. Disable Offline Files. For information, Google "disable offline files"
This is the basic layout of the typical client-server setup on a TCP/IP network. Install the latest versions of both Internet Explorer and Edge if using Windows 10 or newer. All customers using Shift4 for credit card processing must upgrade to Internet Explorer 10 or newer. Emailing confirmation letters, folios, etc. requires Microsoft Outlook to be installed and configured if Outlook is to be used in sending the emails. The Events and Catering module requires Microsoft Word to generate documents. Dedicated high speed internet access to the Execu/Suite server with a static IP address. Merchant Services Provider with a platform compliant with Shift4. Shift4 works with all major platforms. 7zip is required to extract archives outside of Execu/Vault. Microsoft SQL Server™ 2005 Express or better. Microsoft SQL Server™ 2008 R2 SP2 Express or better. HTML Editor for modifying certain forms like Guest Folio, Confirmation Letter, Cancellation Letter, etc. Here's a short list of some. We will not train you in the use of these programs. *** DO NOT USE Microsoft Word to edit the HTML documents. Unless you are very careful when saving the file, code will be added that can render the file unusable. Microsoft's SyncToy, Backup and Restore tool, and File History. These are free and all setup and configuration is your responsibility. 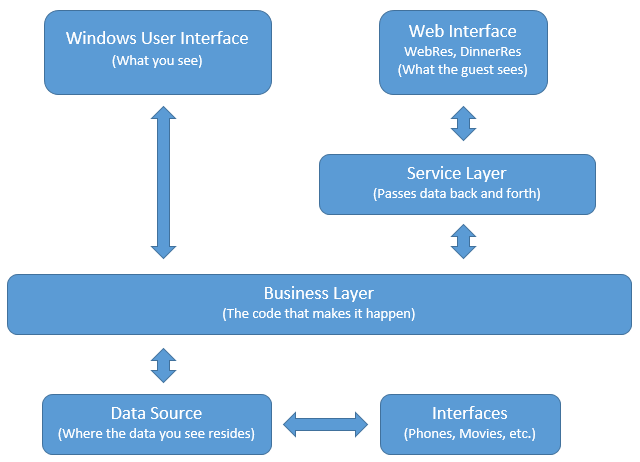 Windows IIS Web server installed on LAN with the Execu/Tech HOTEL server (can be on the same or different server than the server running Execu/suite). Dedicated high speed internet access to the web server with a static IP address.